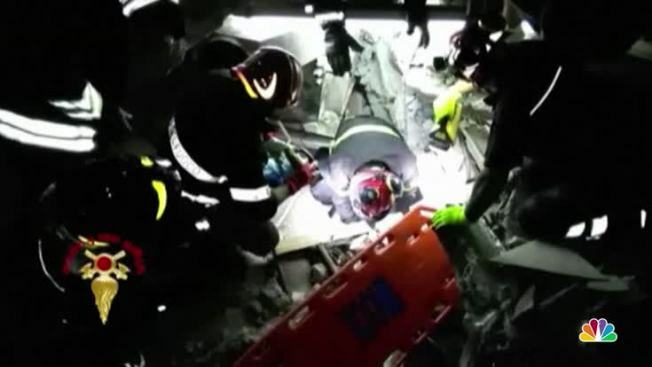 An Italian family of five was "reborn" after all three children buried in the rubble of their home by a 4.0-magnitude quake were pulled to safety Tuesday in a painstaking 16-hour rescue operation on the popular Mediterranean resort island of Ischia. The Toscano family's happy ending brought cheers from the dozens of firefighters who worked through the night to extricate the two boys and their infant brother, trapped alone for hours after their father was rescued and their pregnant mother managed to free herself from their collapsed apartment in the hard-hit town of Casamicciola. "I don't know how to define it if not a miracle," the boys' grandmother, Erasma De Simone, said after the family was reunited at a hospital. "We were all dead, and we are reborn." Though relatively minor in magnitude, the quake Monday night killed two people, injured another 39 and displaced some 2,600 people in Casamicciola and the neighboring town of Lacco Ameno on the northern end of the island. A red building in Amatrice that survived an earthquake that struck central Italy in August crumbled on Oct. 26 after the area was hit by aftershocks. The Palazzo Rosso and the city hall came down following the three tremors. Piles of red rubble fill the streets of the historical part of the town, which was almost entirely wiped out by the original 6.2-magnitude quake. The damage in Ischia focused attention on two recurring themes in quake-prone Italy: seismically outdated old buildings and illegal new construction with shoddy materials. 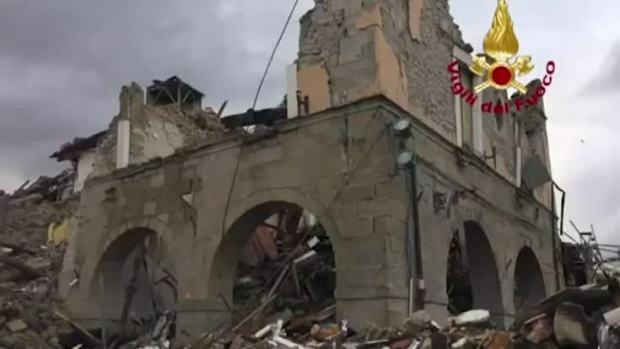 One woman was killed by falling masonry from a church that had suffered damage in a quake centered in Casamicciola in 1883 that killed more than 2,000 people. Another died in the same apartment complex where the family was saved. Rescuers hailed the courage of the older boys, who spent 14 and 16 hours respectively waiting to be freed, talking with firefighters all the while, eventually receiving water and a flashlight. One official credited the older boy, 11-year-old Ciro, with helping save his 8-year-old brother, Mattias, by pushing him out of harm's way under a bed. The boys' grandmother described Ciro as shaken by the ordeal. While Mattias was scared, he also "was sorry because he lost the money in his piggy bank, and lost his toys," she told the ANSA news agency. When the quake struck just before 9 p.m. Monday, the boys' father, Alessandro Toscano, said he was in the kitchen while his wife, Alessia, was in the bathroom and his two older sons in their bedroom. His wife managed to free herself through the bathroom window, Toscano told RAI state television, while he was rescued soon afterward by firefighters. But the three boys remained trapped when the upper story of the building collapsed. In their bedroom, 11-year-old Ciro pushing Mattias under the bed. 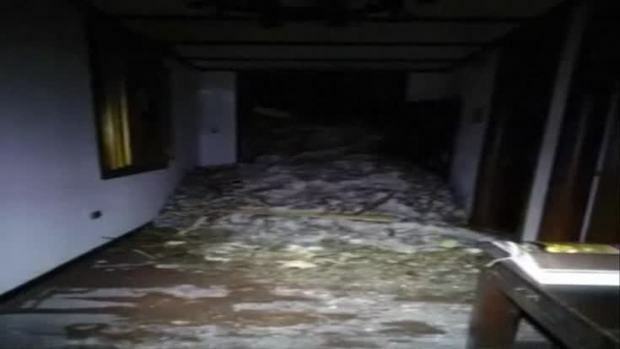 An avalanche buried a four-star spa hotel in a mountainous earthquake-hit region of central Italy, leaving at least 30 people missing, authorities said on Thursday. Footage from rescuers showed the destruction inside the Hotel Rigopiano. "The gesture surely saved them both," said Andrea Gentile of the Italian police. "Then with the handle of a broom he knocked against the rubble, making them heard by rescuers." The baby, 7-month-old Pasquale, was in the kitchen in a playpen, and the first to be rescued around 4 a.m., seven hours after the quake struck. He cried as rescuers passed him to safety, but looked alert in his still-white onesie. Firefighters said reaching the two older boys was more delicate, requiring them to create a hole in the collapsed ceiling without destabilizing the structure. Mattias was extricated first, emerging seven hours after his baby brother, covered in cement dust in his underwear as he clung to firefighters. He was quickly strapped onto a stretcher and whisked into an ambulance. Finally came Ciro, who rescuers said kept the conversation going throughout the ordeal even though one of his legs was immobilized by the rubble. At the hospital emergency room entrance, his parents awaited his arrival, his mother, who is five months pregnant, sitting in a wheel chair alongside his father, whose hand was bandaged from a fracture. "It was a terrible night. I don't have words to explain it," Alessandro Toscano told RAI television. Despite their ordeal, hospital officials say the three children were in remarkably good condition. The two older boys were being treated for dehydration and Ciro for a fracture to his right foot. They were expected to be discharged from the hospital Wednesday. "For three children saved from the rubble, we have witnessed a true miracle. They are miraculously healthy," said Virginia Scafarto, director of the island's Rizzoli hospital. The quake struck just two days shy of the one-year anniversary of a powerful 6.2-magnitude earthquake that devastated several towns in central Italy, killing more than 250. The Ischia quake hit the resort island famed for its thermal waters during the height of the tourist season, with its population of 64,000 swelled by another 150,000. Many visitors took refuge in parks, sleeping under blankets in the aftermath while authorities began organizing ferries to bring tourists back to the mainland. By late Tuesday, some 11,000 had left for Naples. Tourism officials said that the damage was localized to Casamicciola and Lacco Ameno, with much of the island business as usual by Tuesday. According to Ermanno Mennella of the Federablberghi hoteliers association in Ischia, just 10 of the island's 310 hotels were impacted by the quake and only three or four were closed for inspection. Together with the nearby island of Capri, Ischia is a favorite island getaway for the European jet set and German Chancellor Angela Merkel has been known to visit at Easter. The extent of the damage for a relatively light quake raised questions about the prevalence of illegally built structures, often with shoddy materials, on the island in the seismically active area off Naples and the active volcano Vesuvius. Fabrizio Pistolesi, the head of Italy's national architecture advisory board, told SKY television that many buildings on the island were built before seismic codes were adopted. He also cited the high incidence of illegal construction on Ischia and generally in the Campagna region that includes both the resort island and Naples. "We know well that in Campagna, more than 200,000 homes were illegally constructed We are talking about homes constructed in absolute scorn of seismic norms," he told Sky TG24. Former Naples prosecutor Aldo De Chiara said most of the recently constructed buildings on Ischia were built without necessary permits, and many with poor quality cement. "We warned about the risk of collapses also in the case of not particularly serious temblors," De Chiara told Corriere della Sera newspaper. "Unfortunately, what we had denounced happened last night."